2.While this is cooling, drain the grape leaves and carefully pull them apart. Put them into a bowl and cover them with cold water. Let them soak until you are ready to roll. 3.Place a grape leaf on your work surface, shiny side down. Add 1 tablespoon of the rice mixture to the middle of the grape leaf. Fold the sides over the rice and roll the leaf into a small log shape, about the size of your thumb. Repeat with the remaining rice, placing the stuffed leaves into a pot. 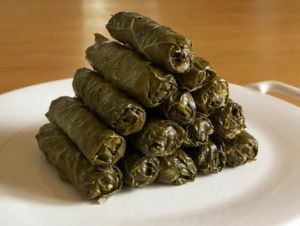 When the dish is full, cover the stuffed leaves with several layers of flat grape leaves and pour in 1 cup of water. Cover and cook the leaves on medium heat for 1 hour. serve immediately.